This is one of our favorite designs in Dependable Weddings, our lineup of customizeable letterpress wedding invitations. 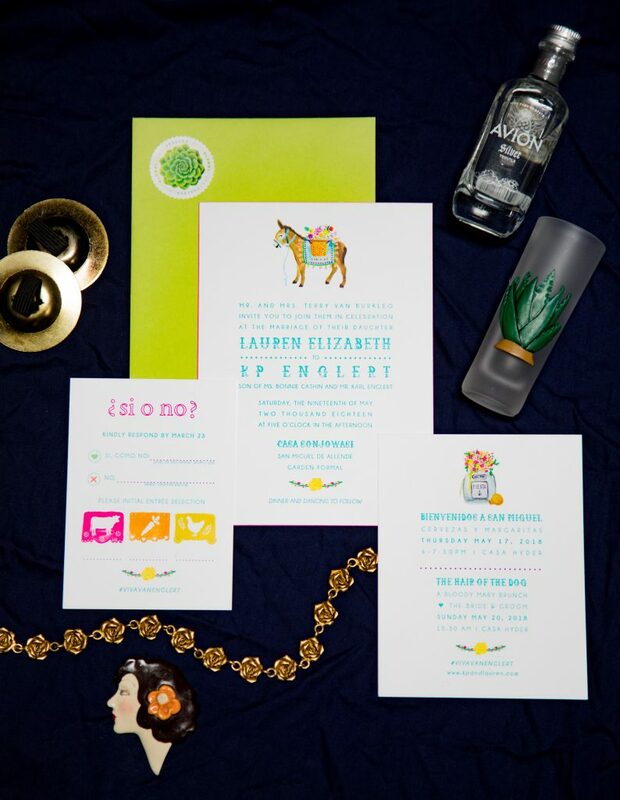 Burro y Flor, originally designed for a destination wedding in San Miguel Allende, features digitally printed watercolor illustrations. These include a flower-laden burro, festive papel picado, floral garlands, and a colorful bouquet peeking out of a tequila bottle. The text of this wedding invitation is letterpress printed. The use of letterpress lends a level of formality and craftsmanship to the playful design. 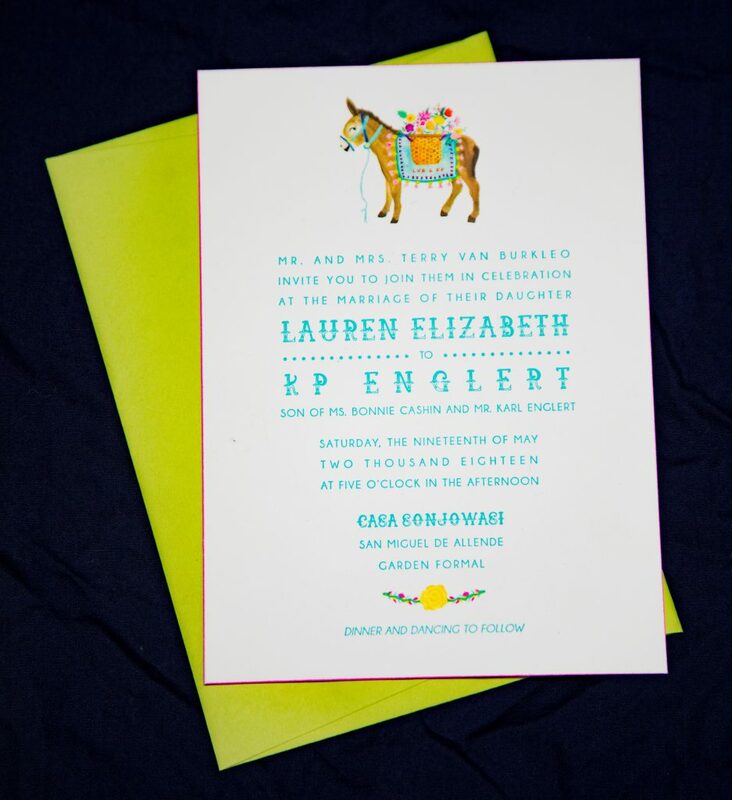 The typefaces, which are modern and fun, coordinate with the papel picado. The text is printed in light blue, but we can customize the letterpress ink color according to your preference. The watercolor illustrations are digitally printed by a local partner, and are of the highest quality. We work closely with the digital printers to achieve results that we can be proud of. Combining letterpress and digital printing is powerful! Digital printing allows us to use an abundance of colors while remaining affordable, and adding letterpress maintains a timeless, tactile quality. Letterpress printing also allows the fine lines of the text to maintain their integrity even when using a bright, light ink color. Because of the digital printing we print this invitation on single-ply cotton paper, whereas we print most of our other letterpress wedding invitations on double-thick paper. However, we can create a double-thick version of this invitation by duplexing (gluing) an additional sheet of paper to the back. Duplexing can be an opportunity to add even more color by using a different color of paper on the back! For more details, and to shop this design as well as our other letterpress wedding invitations, click here. We provide transparent pricing for all of our suites, but if you are interested in further customization don’t hesitate to get in touch. We are happy to provide quotes for pieces or add-ons that may not be shown here. 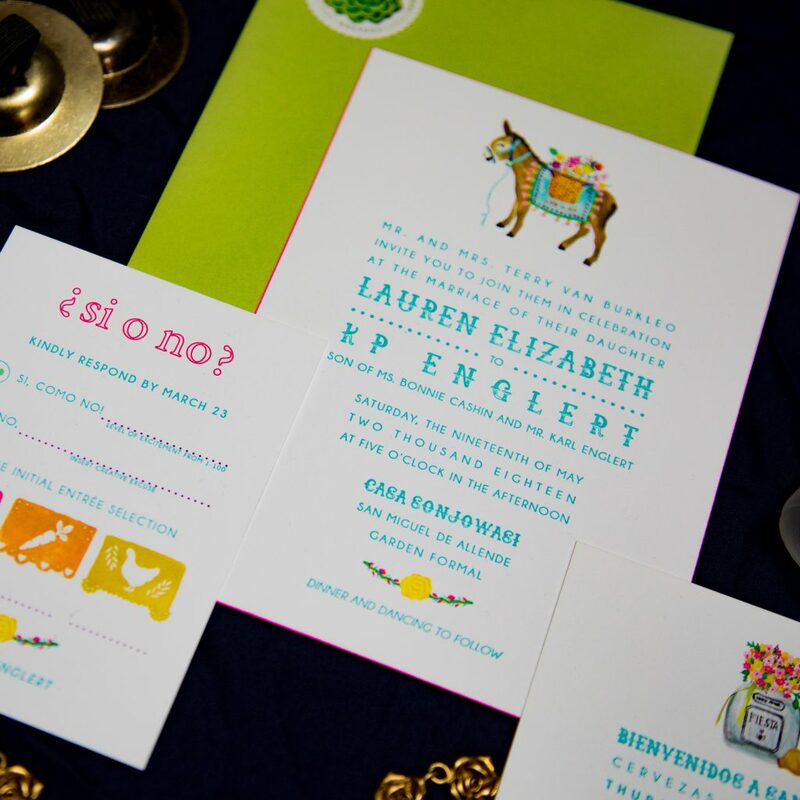 The designs in this suite were created for Dependable Letterpress by Nicole Baker of Foreignspell.